An iterative Inverse Kinematics solver is implemented using Conformal Geometric Algebra. We use a human hand as an example of implementation where a constrained version of the IK solver is employed for pose tracking. The hand is modelled using CGA, taking advantage of CGA's compact and geometrically intuitive framework, that basic entities in CGA, such as spheres, lines, planes and circles, are simply represented by algebraic objects. Geometric Algebra (GA) provides a convenient mathematical notation for representing orientations and rotations of objects in three dimensions. The Conformal model of GA give us the ability to describe algorithms in a geometrically intuitive and compact manner since basic entities, such as spheres, lines, planes and circles, are simply represented by algebraic objects. GA is also more numerically stable and more efficient than rotation matrices making it popular for applications in computer graphics and robotics. Rotors are simpler to manipulate than Euler angles and avoid the problem of gimbal lock (Gimbal lock is a common problem associated with Euler angles and occurs because two axes become aligned during rotational operations, producing unexpected behavior since one degree of freedom is lost). CGA was chosen to describe a fast iterative Inverse Kinematics solver (FABRIK) since it simpifies the mathematical model (basic entities, such as spheres, lines, planes and circles, are simply represented by algebraic objects). 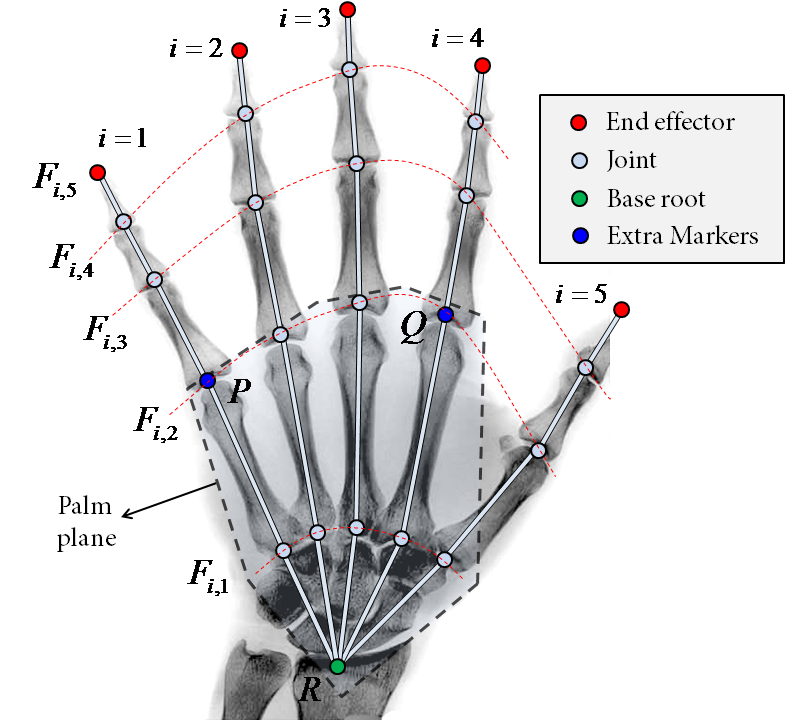 A simple and efficient methodology for tracking and reconstructing 3d hand poses using a markered optical motion capture system is also presented. It is assumed that the hand geometry, meaning the initial joint configuration of the hand, is known. Also, it is assumed that the hand palm is flat and that the orientation of the hand is given by the hand palm. The model is highly constrained with rotational and orientational constraints implemented using CGA. FABRIK was then applied to fit the rest of the joints; the end effector positions are markers which are attached at the end of each finger and they are captured using an optical motion capture system (Phasespace). The proposed IK solver and hand model are real-time implementable and the resulting motion is smooth and natural.